Trolling the Thesaurus: Timely Tool or Woeful Crutch? Yesterday, I snapped the handle on this lovely old set of loppers by cranking too hard on a branch bigger than what the tool was intended for. That’s not my first inappropriate use of tools—once I tried to boot-bust a board angled on some steps and it snapped up and sliced my face like a cold cut. A colorful reminder that genius doesn’t run in the Bentley handyperson’s gene. 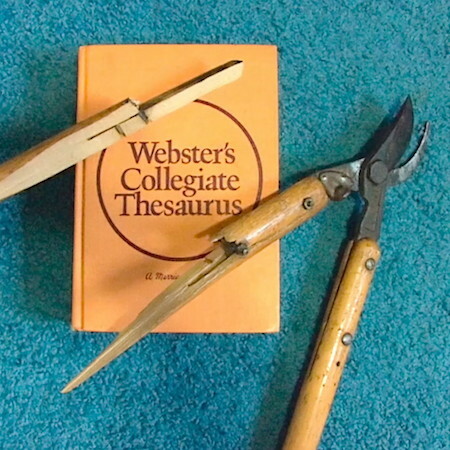 But mangling the loppers made me think of twisting tools from their intended use, and being the metaphorical sort, the thesaurus came to mind. Relying on a thesaurus to write an article or story can be like using a bazooka to clean a bit of dust from your cabinets—instead of blowing away the dust, you’ve blown out the wall. Here’s the trouble: You may have crafted a sentence with perfectly good words, but then writer’s anxiety sets in. Couldn’t this sentence have more kick? Doesn’t it need an alligator belt and lizard-skin shoes to really speak its piece? How can anyone sense the weight of my words if a few of them aren’t blacksmith’s anvils? The shrewd crossbow collector will seek multiple opinions before buying a 4th-century Greek crossbow. But then she fidgets and thinks, Hmm, couldn’t I give that sentence a little more oomph by substituting a few synonyms? After all, I did say “crossbow” twice. The perspicacious crossbow accumulator will solicit manifold perspectives before procuring an antiquarian armament. When she heard the rustle in the grass, she jumped to the other side of the path. Now there’s nothing wrong with that sentence, but what if it’s not what you, the writer, is hearing in that grass, the thing that makes you and the character jump? What if “rustle” doesn’t have the sense of threat or menace that you seek, but another word doesn’t surface? Then you can go to the candy store of the thesaurus, because when you want a Kit Kat, and you only have a Snickers, you won’t be satisfied. Checking out my electronic candy store (the thesaurus that accompanies the Mac OS dictionary), I see swish, whoosh, swoosh, whisper, sigh. Leaning my ear to that secret in the grass, I sense that “whisper” is the winner. Now you might think that’s adding artificial flavors to your writing, but not when you use the flavoring in this way: you are using the promptings of the synonym suggestions to season the sentence how you most accurately sense it. And like I said, this isn’t something you’d do to torture all of your sentences. Just the ones where you know there’s a better word, the word that makes your sentence intention glow. The thesaurus is just a light source—you direct it. Scanning synonyms for a single word change can often stimulate your thinking about a setting, character, conflict. Perhaps a full new paragraph, contributive to the work, might emerge. The new word can refine a sentence, rather than burden it, or refine your thinking about how the sentence works in its larger setting. And if you plain-out like words, it’s good fun to muck about in them. Take a word like “bungle.” Traipse around its synonyms and you play footsie with things like “botch,” “muff,” “fluff,” “flub,” and “make a hash of.” Tasty hash indeed. Of course, you shouldn’t do much thesaurus trolling when you’re in the flow of your draft—let the words roll, and edit later. And don’t ever go into synonym rapture, where your sentences are so larded with fifty-cent words that they move like soggy dough. That ain’t writing—that’s bad architecture, where a story collapses of its own weak weight. From my view, you’re no loser if you try to selectively fine-tune your writing by dipping into the thesaurus. Done with care, you’re still writing in your own voice; you’re listening to yourself with both ears pricked. By the way, I’m going to see if I can get those loppers fixed. Good tools deserve a good long life.